An overview of where the Catechisms emerged. It was early in 1647 that the Assembly addressed itself to the composition of the two Catechisms we know as the Larger and Shorter. On January 14th of that year it was ordered “that the Committee for the Catechism do prepare a draught of two Catechisms, one more large and another more brief, in which they are to have an eye to the Confession of Faith, and to the matter of the Catechism already begun”. From April 15, 1647, a good part of the time of the Assembly was devoted to debate on the Larger Catechism. In no country has the Shorter Catechism exercised a greater influence than in Scotland. Yet the evidence requires the conclusion of A. F. Mitchell that “though in Scotland, as elsewhere, this catechism has been, and deservedly so, the most popular of all the productions of the Assembly, it was the one with the elaboration of which the Scotch Commissioners had least to do” (The Westminster Assembly, London, 1883, p. 429). This conclusion must not, however, be allowed to obscure or minimize the importance of certain other facts. The Shorter Catechism was completed on or before November 25, 1647. On November 15th the Catechism was read as far as the fourth commandment and was ordered to be transcribed. It was only six days earlier that Samuel Rutherford took his leave of the Assembly. Rutherford was, therefore, at Westminster until the greater part of the work on the Shorter Catechism had been performed and for three weeks after the Larger Catechism had been completed. In this connection the minute of October 15th is full of interest and significance. After the Larger Catechism was ordered to be transcribed, we find that upon motion by Mr. Rutherford it was ordered to be recorded in the Scribes’ books that “the Assembly hath enjoyed the assistance of the Honorable Reverend and learned Commissioners from the Church of Scotland in the work of the Assembly; during all the time of the debating and perfecting of the 4 things mentioned in the Covenant, viz. the Directory for Worship, the Confession of Faith, Form of Church Government, and Catechism, some of the Reverend and learned Divines Commissioners from the Church of Scotland have been present in and assisting to this Assembly”. It would, therefore, be going too far to say that the Scottish Commissioners exercised no influence in the preparation of the Catechisms. Rutherford may have exercised considerable influence in the preparation of both Catechisms. And Gillespie may have exercised considerable influence in the preparation of a great part of the Larger Catechism. Besides, it must be remembered that the Scottish Commissioners took a very active part in the prolonged study of catechism that antedated January 1647, when the Assembly addressed itself to the task of preparing the two Catechisms finally approved. Even though, as A. F. Mitchell points out (op. cit., pp. 414-15), the Scottish Commissioners in these earlier discussions favored a method of catechising different from that followed in the Larger and Shorter Catechisms, it is nevertheless impossible to believe that the influence, theological influence at least, of the Scottish Commissioners has not left its mark upon both Catechisms. Furthermore, we must not forget that the order of January 14, 1647, directing the Committee for the Catechism to prepare a draft of two Catechisms, instructed the Committee to have an eye to the Confession of Faith and to the matter of the Catechism already begun. Though it is true, then, that the Scottish Commissioners had less to do with the preparation of the Catechisms than with the other documents, there are also several considerations which prevent us from concluding that their influence was negligible. 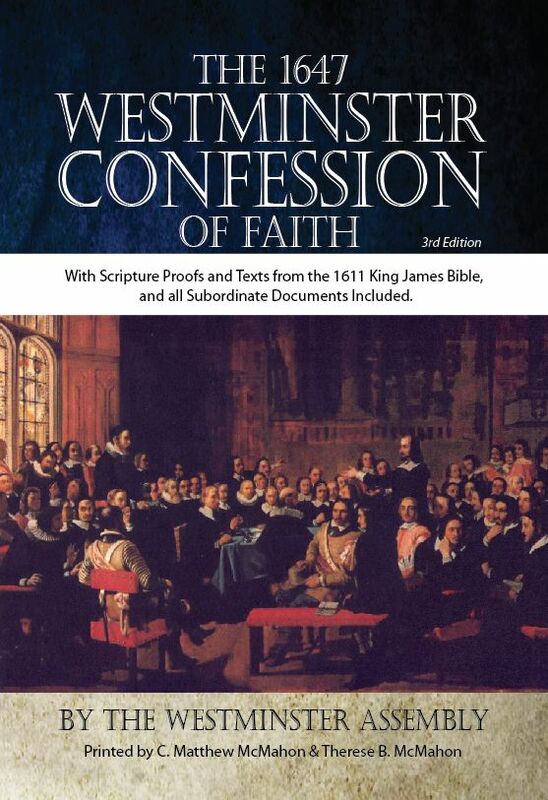 The Catechisms of the Westminster Assembly were, of course, intended to serve a different purpose from that of the Confession, and any comparison of the Catechisms with the Confession should bear this in mind. It should be said, however, that the formulations of the Catechism, especially of the Larger, are at certain points an improvement over the formulations of the Confession. It is altogether natural that the greater maturity of thought attained at the time the Catechisms were prepared should have had this effect. For example, the formulation of the doctrine of the Covenant of Grace found in the Larger Catechism is more lucid and felicitous than that found in Chapter VII, Section III, of the Confession. A comparison of this section with Questions 30 to 32 in the Larger Catechism will readily show what is meant. Again, the definition of the sinfulness of the estate into which the fall brought mankind, given in both Catechisms, is in at least one respect more adequate than Chapter VI, Sections I to IV, of the Confession. This concerns the question of the imputation of the guilt of Adam’s first sin, a doctrine distinctly asserted in the Confession (Chapter VI, Section III) but not clearly grounded in the covenant relationship between Adam and posterity, as is done in the Larger Catechism, Question 22, and in the Shorter, Question 16. Well-grounded may be the surmise of William Cunningham that the discussions taking place in France in connection with Placaeus’ doctrine of mediate imputation and the decisions of the Synod of Charenton (1644-1645) had become better known and their implications better understood when the divines prepared the Catechisms. In any case, greater precision is manifest in both Catechisms than appears in the Confession. Examples like these show how necessary it is, in determining the position of the Westminster Assembly, to consult the Catechisms as well as the Confession, and in the matter of the subordinate standards in Presbyterian churches a great deal is to be gained by the inclusion of the Catechisms as well as the Confession.